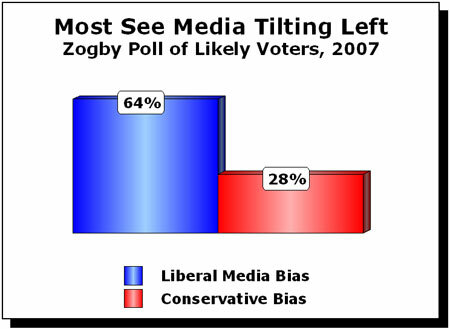 In a February 20-26, 2007 survey conducted for the Politics Online Conference 2007, the George Washington University's Institute for Politics, Democracy and the Internet paired with Zogby Interactive to question 1,757 likely voters about their perceptions of media bias. The pollsters found 'the vast majority of American voters believe media bias is alive and well,' with only a tiny 11 percent of the public saying they don't think the media take political sides. And by a huge margin, the public suggested the media's bias tilts in favor of liberals, not conservatives. The vast majority of American voters detected media bias: '83 percent of likely voters said the media is biased in one direction or another, while just 11 percent believe the media doesn't take political sides,' Zogby reported.